It’s a Wonderful Life (1946) owes a debt to another festive tale of the supernatural, Charles Dickens ‘A Christmas Carol.’ In Dickens story Scrooge is shown the error of his ways so he can change his behaviour and find salvation. 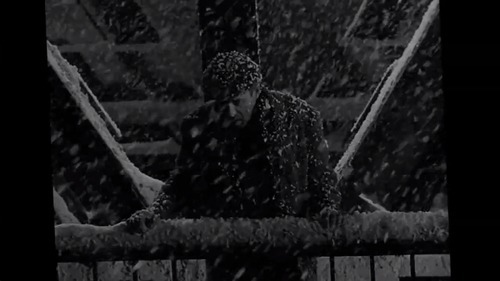 Capra uses a similar narrative device in It’s a Wonderful Life except his character George Bailey (James Stewart) has always been a decent fellow. George runs a building society and tries to do his best by the townsfolk. Everybody likes and respects him. Yet he feels useless, driven to despair by his rivalry with the richest man in town, and considering ending his life. It’s a Wonderful Life was James Stewart’s first film after returning from active service piloting bombers in the United States Air Force during WWII. Capra’s comedies with their irrepressible optimism and all-American values made him the most successful director in Hollywood during the 30’s and 40’s. However like many working in the industry at the time Capra had a European background. Sicilian born, his parents emigrated when he was a boy and his success is the embodiment of the American Dream. Like Stewart he took part in WWII, filming a series of acclaimed documentaries from the front line. Though he fell out of fashion in the 50’s, films like It’s a Wonderful Life, It Happened One Night (34), and Arsenic and Old Lace (44) mark him out as one of the most influential filmmakers in American cinema. Clarence (Henry Travers), a lowly Angel yet to earn his wings, appears to George and shows him how his small town would have turned out if he had never been born. It’s a Wonderful Life is an American classic offering hope to the post-war generation and a country still recovering from the effects of the Great Depression. Though often accused of being overly sentimental the film is realistic about the hardships people often face. Capra’s final message is simple and heart-warming though. Everybody matters regardless of how trivial their lives may seem.